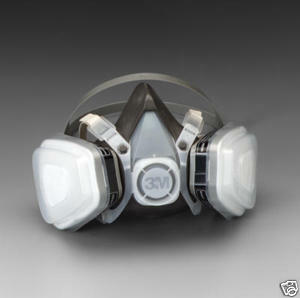 3M respirators are recommended for spray paint applications, with maintenance free design for convenience. Half Facepiece respirators may be used up to 10X OSHA PEL or applicable government standard, whichever is lower. If exposure levels are not known, use a 3M Fresh Air system. NIOSH 42 CFR 84 approved. 3M recommended for paint spray applications. At least 95% filtration efficiency against solid and liquid aerosols including oils. Assembly includes : 1 organic vapor respirator, 2-N95 filters and 2 filter retainers.